Artifacts suggest that an extinct human species left Africa about 250,000 years earlier than previously thought. (Inside Science) -- Stone artifacts unearthed from steep hills in China may be the earliest signs of extinct humans outside of Africa, scientists say. Although our species, Homo sapiens, is now the only surviving member of the human lineage, Homo, other species of humans once roamed across Earth. So far the oldest known human fossil is a jawbone from Ethiopia roughly 2.8 million years old. Outside of Africa, the oldest previous evidence of hominins -- members of the human family tree after our split from the ancestors of chimpanzees -- was found in the medieval hilltop town of Dmanisi in the country of Georgia, in the form of bones and stone artifacts of Homo erectus, the first human species known to regularly carry around tools it made. These finds dated up to 1.85 million years old. 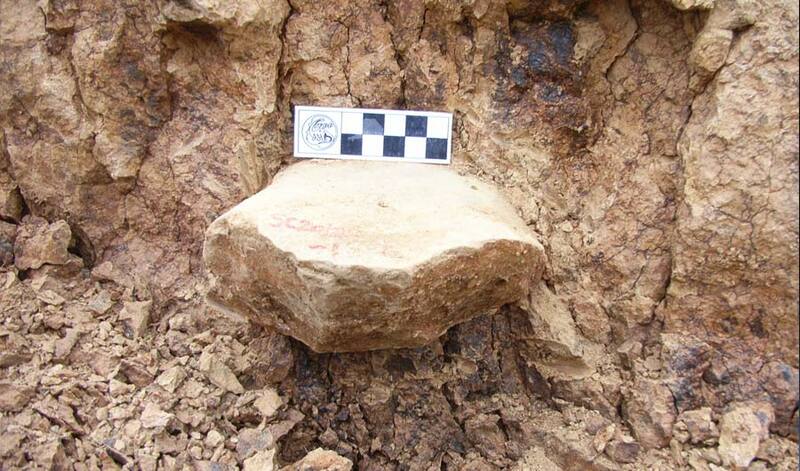 Now, stone artifacts from southern China may break that record with a date of up to 2.1 million years old. "The most important implication of our findings is that hominins had already left Africa 250,000 years earlier than previously thought," said study co-author Robin Dennell, a paleolithic archaeologist and paleoanthropologist at the University of Exeter in England. "We are talking here probably of a very early form of our own genus Homo." Study lead author Zhaoyu Zhu, a geologist at the Chinese Academy of Sciences in Guangzhou, and his colleagues investigated China's 270,000-square-kilometer Loess Plateau, which is named after its loess, or wind-blown silt. The area now is dominated by wheat. Before agriculture, it alternated between temperate grassland and colder, drier steppe grassland, Dennell noted. The steepness of the slopes in the area made excavations tricky. "On some, we had to cut footholds," Dennell recalled. "The sediments are soft and, after rain, very slippery." Most of the 96 artifacts the researchers discovered are either flakes struck from a stone or a stone core with a few flakes removed, Dennell said. "The intention of flaking was to produce something with a sharp edge that could be used for, as an example, cutting meat off a carcass," he said. Excavations around the area also revealed the lower jaw fragment of a deer, as well as cattle and other animal fossils. Can The Skull Tell Us If An Ancient Human Walked Upright? The excavation site lies about 5,650 kilometers away from Dmanisi as the crow flies. Still, these artifacts "are similar to ones from Dmanisi and East Africa," Dennell said. "Those in East Africa are usually called Oldowan, after Olduvai Gorge in Tanzania. The ones from Dmanisi and China are Oldowan-like -- simple flakes and cores, showing a high degree of skill in detaching a flake with a sharp edge." The scientists did not find any natural stone outcrops nearby. They suggested the raw materials from these stone tools came from the foothills of the Qinling Mountains about 5 to 10 kilometers south of the site. The artifacts were found across 17 layers of sediment. To date them, the researchers analyzed magnetically sensitive minerals in the sediments. Earth's magnetic field regularly reverses about every several hundred thousand years, with its magnetic north pole becoming magnetic south and vice versa, and when these sediments become rock, their magnetically sensitive minerals become set in stone pointing to where the poles were at that particular moment in Earth's history. Previous research that pinpointed when the poles flipped then helped reveal the ages of the sediments, and by implication any artifacts found in them. All in all, the artifacts spanned roughly 850,000 years. They suggest that hominins occupied the area repeatedly, although not necessarily continuously, between 1.3 million and 2.1 million years ago. Since the researchers have not yet unearthed any fossils linked with these artifacts, it remains uncertain which species created the stone tools. "Unfortunately, human fossils are very rare and fragile, whereas stone tools are much more common and likely to survive," Dennell said. The epoch in which these artifacts were made, known as the Pleistocene, was a time of extreme fluctuations in climate. Data from the sediments suggest the hominins that created these tools probably migrated to the area during warmer and wetter intervals rather than colder and drier ones. Given the age of the artifacts, they were likely created by H. erectus, whose fossils have so far been unearthed in Africa, western Asia, China and Java. This extinct human species "had a small brain and body, could walk and probably run," Dennell said. "Overall, early Homo erectus was a bipedal, tool-using omnivore that ate meat whenever it could, either by scavenging from a carcass or maybe from hunting small or ill animals opportunistically. We also know that it was a social animal that lived in groups, looked after its sick, and cared for its young." Paleoanthropologist Maria Martinon-Torres said the findings made her very curious about the identity of this first Asian explorer. “Who were they? Are the toolmakers related to the Dmanisi expansion? Perhaps they represent an earlier migration related to Homo habilis?" said Martinon-Torres, who is director of Spain's National Research Center for Human Evolution in Burgos and did not take part in the research. H. habilis is often thought of as the earliest known human species. The artifacts detailed in the new paper look rather primitive, she added, which suggests that sophisticated tools were not necessary to leave Africa. The new discovery, combined with recent work, suggests that "Asia is gaining a more prominent role in the explanation of our origins," Martinon-Torres said. "More fieldwork is needed to connect the dots among sites." In the future, Dennell said he hopes the researchers "decide to look at layers older than 2.1 million years. And there is always the possibility of finding skeletal evidence." The scientists detailed their findings in the July 12 issue of the journal Nature.